Gaza Action Ireland launched its Gaza Kids to Ireland project today in Dublin, with the support of Brian Kerr, former Irish national team manager, who spoke very eloquently and passionately on the terrible and illegal obstacles apartheid Israel imposes on Palestinian football players both in Gaza and the West Bank. These include preventing the team from playing and training together, imprisoning players and coaches and have also seen players being shot, coupled with the bombing of the stadium in Gaza. In this light Kerr noted that the achievement of sports people in Palestine to continue to try to play and to compete successfully is remarkable. He also remembered the four children from the Bakr family who were murdered as they played football on the beach in Gaza this summer in Israel’s murderous assault which killed more than 2,200 people. Many thanks to everyone who came along and have been helping out with this project, particularly to the chair and vice-chair of the Ireland-Palestine Solidarity Campaign, Martin Quigley and Fatin Al Tamimi. Also to Peter Houlihan for the photos. 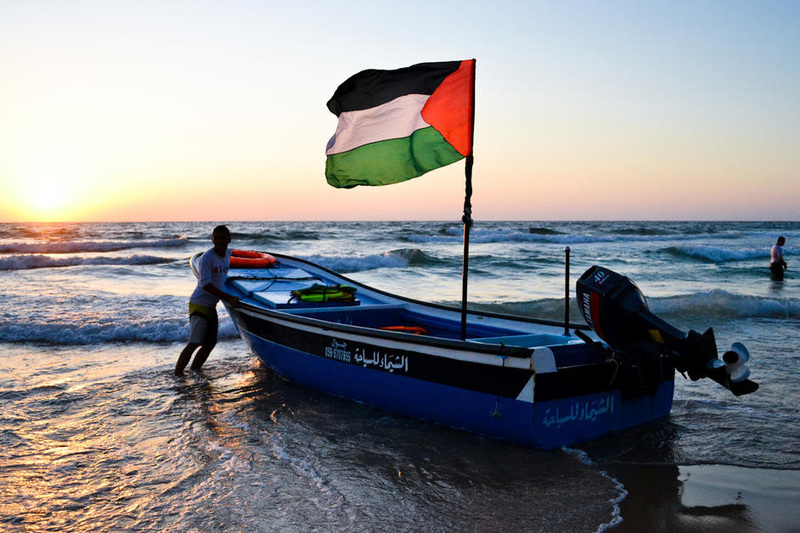 We will keep people notified on how to get involved with this project, meanwhile if you would like to donate, please see the Gaza Action Ireland website. 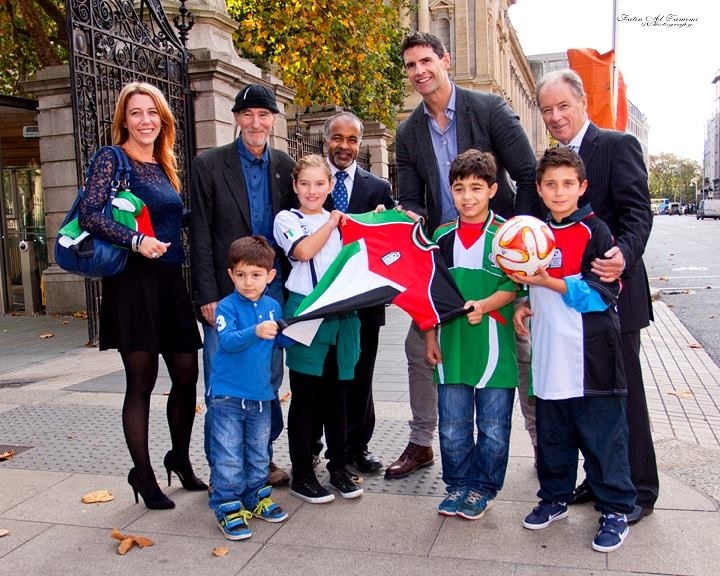 A TEAM of Palestinian children from the besieged Gaza strip will play football in Ireland next summer, thanks to an initiative launched today by former Irish manager and leading football pundit Brian Kerr. Hundreds of children were killed and approximately 3,000 were injured in Israel’s summer onslaught on the territory. Under-14 members of the Al-Helal club, based in northern Gaza, will play against teams from Dublin, Tipperary, Limerick and Antrim during their visit next August. The ‘Gaza Kids to Ireland’ trip will see the children make a daunting journey across Egypt’s Sinai Desert, because the simpler route through Israel is closed by the illegal siege, and because Gaza doesn’t have an airport. It is being organised by Gaza Action Ireland (GAI) and Antrim to Gaza, who need to raise thousands of euro to support the initiative. 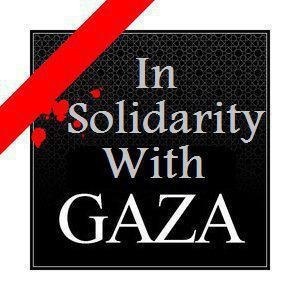 Contributions can be made at www.gazaactionireland.ie. “Most people in Ireland were sickened at the sight of what Gaza’s men, women and children suffered under Israeli bombardment in July and August,” ex-rugby international Trevor Hogan, one of the GAI organisers of the visit, said today. “But the maiming and murder of so many kids was especially heartbreaking. Al-Helal’s clubhouse was damaged in the Israeli assaults of 2012 and 2014. It stands close to the beach, but the sea there is usually too polluted with sewage for the children to play in it. GAI coordinator Zoë Lawlor said the organisers were delighted to have the support of many Irish sportspeople. 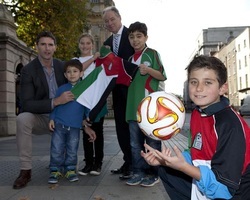 A TEAM of Palestinian children will play football in Ireland next summer, thanks to an initiative to be launched next Wednesday by former Irish manager and leading football pundit Brian Kerr. Ex-rugby international Trevor Hogan, one of the organisers of the visit, will also speak at the launch. Under-14 members of the Al-Helal club, based in northern Gaza, will play against teams from Dublin, Tipperary, Limerick and Belfast during their visit next August. The trip – which will see the children make a daunting journey across Egypt’s Sinai Desert, because the simpler route through Israel is closed by the siege – is being organised by Gaza Action Ireland and Antrim to Gaza, who need to raise thousands of euro to support the initiative. Al-Helal’s clubhouse was damaged in the Israeli assaults of 2012 and 2014. With the nearby sea polluted by sewage, football is often the only exercise and entertainment available to Gaza’s children, who have just lived through the third major attack in less than six years on the territory where they live. The organisers are pleased to have the support of many Irish sportspeople, including Kerr, who also serves as a director of SARI (Sport Against Racism Ireland). Photographs of children from Al-Helal and of their Gaza facilities will be available on the day. The launch for the Limerick “leg” of the ‘Windows Into Gaza’ exhibition took place on Thursday, 2nd October at 6pm at 69, O’Connell St. ‘Windows Into Gaza’ is an exhibition organised by Gaza Action Ireland and curated by Felim Egan. The event was officially opened by artist Sean Taylor and Zoe Lawlor of Gaza Action Ireland.‘Windows Into Gaza’ first arrived in Ireland in April where the opening in Dublin was attended by a number of notable names including the Palestinian Ambassador, the artist Guggi and actor Stephen Rea. 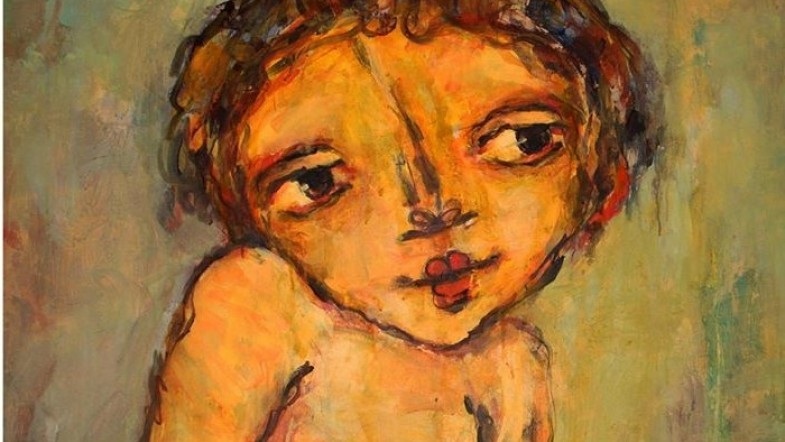 The exhibition by 11 Palestinian artists based in Gaza illustrates the best of painting and photography from the besieged enclave. A side of Gaza, Palestine not commonly known, the side of a people with a deep cultural heritage, full of innovation, hope and peace. 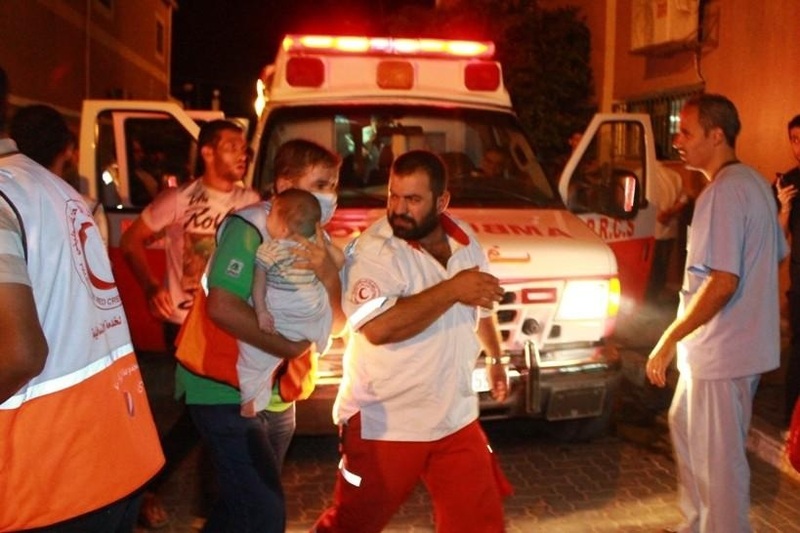 DOCTORS, paramedics, nurses and other medical personnel have called for the Irish Government to take a firm stand against Israeli attacks on medical workers, hospitals and ambulances in Gaza. The protesters, many dressed in scrubs and other clothes of their professions, gathered outside Dáil Eireann with a large crowd of other supporters today [[THURS]] at lunchtime. Some speakers expressed disappointment at Ireland’s abstention in the UN Human Rights Council vote on investigating Israeli war crimes. During the latest onslaught, thus far one doctor and two paramedics have been killed, more than 30 first-responders wounded and two hospitals bombed. A Red Crescent emergency-services unit and numerous clinics and ambulances have been shelled or damaged. “In my professional opinion, the ongoing attacks on medics in Gaza clearly constitute a war crime that cannot be justified and warrant immediate referral to the ICC,” Prof Damian McCormack, a surgeon at the Mater hospital, said. 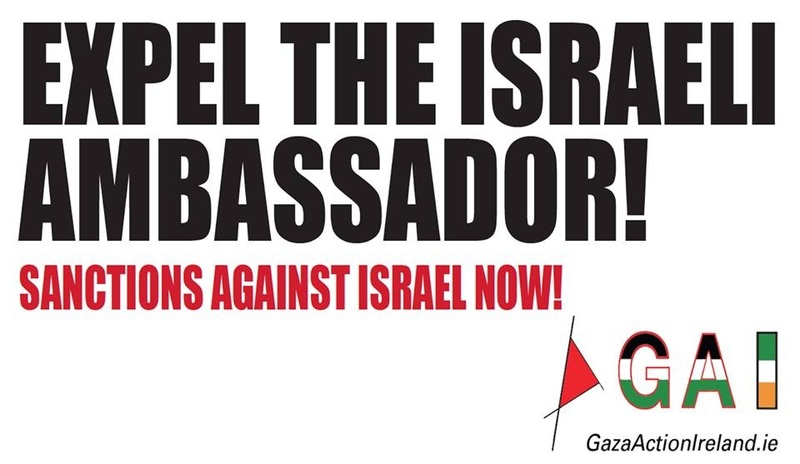 “I call on our government to demand an apology from the Israeli ambassador or to expel him. “Further I call on all medical bodies and colleagues in Ireland to publicly condemn these attacks and not to repeat their shameful silence over attacks on medical personnel in Bahrain in 2011,” McCormack said. 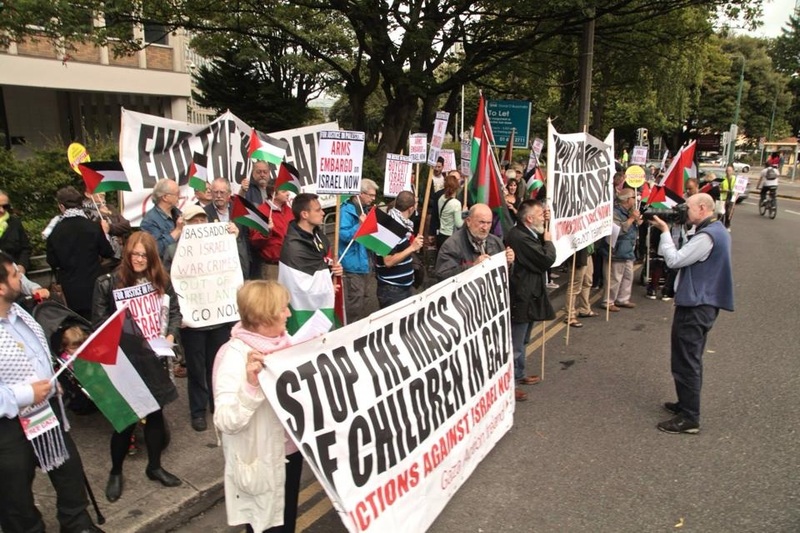 The protest was called by Gaza Action Ireland (GAI) and supported by the Ireland Palestine Solidarity Campaign and Sadaka. “It’s an absolute shame and disgrace that Ireland abstained yesterday on a mere call for an investigation into possible war crimes,” GAI coordinator Mags O’Brien said. ANY RELIEF for the people of Gaza is welcome, but Israel should never have been allowed to have a ‘free week’ to add to its destruction of lives and property there, says an Irish group with extensive contacts in the Palestinian territory. Gaza Action Ireland (GAI) said that despite today’s talks of a ceasefire, Israel must answer for deliberately killing civilians and targeting vital water and sewage infrastructure in Gaza — and for the impunity with which it is prepared to resume the savage assault. One week after the start of the bombing campaign launched by Israel last Tuesday, more than 180 people, including at least 34 children, have been killed in the small coastal strip. Entire families have been obliterated in the massacre. According to Zoe Lawlor, co-ordinator of GAI, “It’s an absolute outrage that this slaughter has happened, and has been allowed to continue by the western countries that provide vital aid and support to Israel. We’ve seen a repetition of the bloody tradition by which Israel gets at least one week of free bombing before there are any serious efforts by international actors to stop the collective punishment of a refugee population. GAI called on the new minister for foreign affairs, Charles Flanagan TD, to take steps to express the Irish people’s anger at the assault, including the removal of the preferential trading status that Israel enjoys with the European Union. “There were thousands of people out protesting all over Ireland on Saturday, yet our Government’s silence is deafening,” Mags O’Brien of GAI said. O’Brien, Lawlor and other members of GAI visited Gaza last year, not long after the destruction from ‘Operation Pillar of Defence’ in November 2012. When they visited it was possible to get through the border crossing with Egypt at Rafah, but the Egyptian closures of both the official crossing and the tunnels that were Gaza’s lifelines have made existence there even more difficult. This echoes a call from Gaza civil-society groups for: an arms embargo on Israel; sanctions that would cut off the supply of weapons and military aid from Europe and the United States on which Israel depends to commit such war crimes; suspension of all free trade and bilateral agreements with Israel such as the EU-Israel Association agreement; boycott, divestment and sanctions, ascalled for by the overwhelming majority of Palestinian civil society in 2005. Lawlor said GAI endorses and supports these calls from Gaza, and urged the Irish Government to heed them.